Crabs are plentiful this year! at Husted's Landing. Crabs are plentiful this year! at Husted’s Landing. Crabs are fun to catch and crabs are great eating too! Have a good crab recipe you would like to share? Click here to go to our Contact Us page to share your recipe. Need a crab recipe? Try this one! 1. In a large bowl, mix together all ingredients, except for the flour and peanut oil. 2. Shape into patties and dust with flour. 3. Heat oil in a large skillet over medium heat. 4. When oil is hot, carefully place crab cakes, in batches, in pan and fry until browned, about 4 to 5 minutes. 5. Carefully flip crab cakes and fry on other side until golden brown, about 4 minutes. 6. Serve warm with preferred sauce. 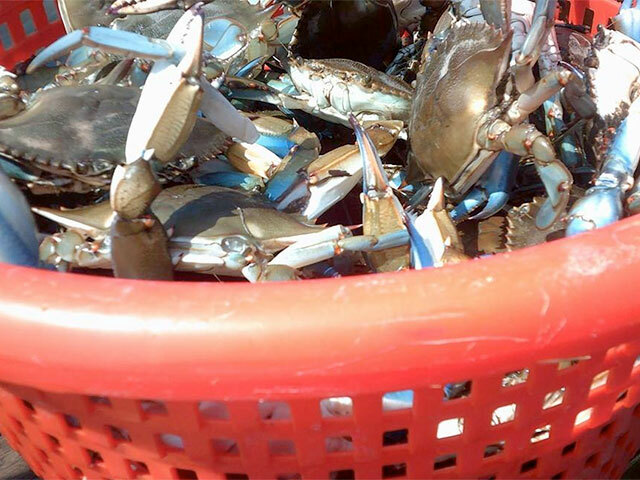 Best eating crabs are cleaned, coated in Old Bay and salt, and steamed in beer – yum! Pick ’em and eat ’em. Or pick the crabs and make crab sauce served over linguine. Also tasty!